Jakarta - PT. Toyota Motor Manufacturing Indonesia (TMMIN) and PT. 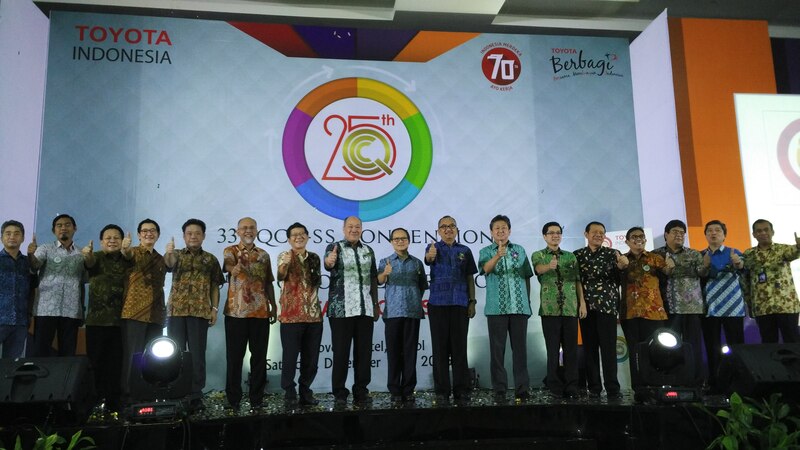 Toyota-Astra Motor (TAM) today holds the 33rd Quality Control Circle Convention (QCC) or Gugus Kendali Mutu (GKM) which also marks the peak of the 25th anniversary of the QCC convention in Toyota Indonesia. Also present at this event, the Secretary of the Director General of Training and Productivity (Binalattas) Ministry of Labor RI - Kunjung Masehat. "In accordance with our spirit that we build people before we build products , as a company that oriented to the development of Human Resources, one of the flagship programs is through the implementation of QCC which we believe can become a vehicle for creating innovative personal minded so they can compete in the era of regional and global competition, "said Masahiro Nonami, President Director of PT Toyota Motor Manufacturing Indonesia. QCC started to be implemented since 1964 in the scope of Toyota Motor Corporation (TMC) of Japan. QCC culture within Toyota Indonesia started to introduce since the 80s. Formally, QCC started rolling since 1989 and became a routine activity that packaged in a convention since 1990 or has entered into 25-year period. By definition, the QCC is a small group consists of employees of the direct executor of work that continuously controlling and improving the quality of work, products and services. In addition to operating independently, the group also utilizes the concepts and techniques of quality control as well as other working device repairment, exploring the creativity of members, and to promote self-development and team development. Warih Andang Tjahjono, Vice President of TMMIN says, the background of QCC activity emergence is the repair process in Toyota that always looking to strengthen bottom-up idea, focus on repairment process, as well as the active participation of every employee in every improvement process. "The main objective of the QCC is on how the companies increase employee participation to improve the work environment so that they can do the job happily, easy, and light which would have an impact on safety, productivity, and product quality," said Warih. QCC program was born from the basic values set out in the corporate culture of the Toyota Way that is respect for people and continuous improvement. Respect for people is implemented in the freedom for every Toyota employee to play an active role in providing improvement ideas in the company. While continuous improvement embodied in continuous efforts on improvement that made by all components in the entire line of operations both in the field of production and administration. In this case, all components of the companies are challenged to never be satisfied with the existing conditions. The positive impact of the implementation of QCC including providing an opportunity for all employees to enhance the capabilities of individuals and at the same time be part of a strong team, shaping the mindset engineer to see and do repairs as creative and innovative, and become the medium on transferring the expertise and skills. TAM president director, Hiroyuki Fukui, said that the QCC which contain elements of Kaizen is an activity that is very basic and has a very important role in Toyota's business. Through the QCC, Toyota can know exactly what is expected by the customer, knowing the problems in each element of Toyota's business in order to meet customer expectations, perform continuous improvement in order to meet customer expectations, along with an increase in the efficiency of business processes as a whole, as well as making ease and regularity of work that will encourage individuals to continually make improvements. "The success key of the QCC lies on the individuals who have the ability, opportunity and pride for the improvements that has been made. This is where the role of management for always giving attention to improving the quality of the individual, adequacy of resources, and giving reward on any improvements that resulting accomplishments, "Fukui said. Realizing the great numbers on the effectiveness of the QCC, Toyota Indonesia seeks to transmit the QCC to the whole supply chain like the local suppliers and dealers. Since 2002, some of the local suppliers of Toyota Indonesia that joined in Toyota Manufacturers Club (TMClub) held QCC Convention which is now known as Kaizen Festival. In the future, local suppliers are intended to spread the QCC activities to other members as well as actively conducting comparative studies on both national and global scale. Nowadays, each Toyota dealers have Kaizen activity, which is supported by the Toyota Astra Motor. Every year, TAM held a National Kaizen Marathon (NKM) to appreciate the kaizen activities conducted on Toyota dealers. NKM itself were aim to introduce QCC activity to dealers that can be used by them to make improvement. Vice President of TAM, Henry Tanoto, said Toyota will continue to strive on providing support in order to continue an ongoing kaizen, both support directly, or through individual quality improvement and increased motivation. "When all the efforts made, it is expected to produce 3 things: employee satisfaction, customer satisfaction, and of course the dealer satisfaction. We hope the spirit of kaizen can be maintained and to be implemented in the workplace to provide the best service to all the Toyota customers, "he said. Since 2013, through the Kaizen Goes to School, Toyota Indonesia have also cooperating with educational institutions, among others with a vocational school in Bekasi area. Kaizen Goes to School received a positive response and acknowledged by the school and the students as a soft skill to develop the character of the participants. Toyota in accordance with the principles of its founders are committed to continuously grow with the society through the development of products that meet the customer needs, enhancing the activity of production, export, distribution, and customer service along with the human resources in line with the spirit to contribute an active role in the development of the national automotive industry in accordance with the spirit of Toyota Berbagi (Toyota, Together Building Indonesia).